Warning: This is not a sewing post. If you are not interested in knitting, come back in a few days and I'll have some sewing to show you. This project has been six years in the making. In my pre-sewing days I was quite a prolific knitter, and one of my proudest achievements was a multicolored wool blanket that I knit for one of my very best friends as a wedding gift. The knitting of the blanket (pre-kids) took about three months. When I was done, I sent this photo to my husband, who was in Afghanistan at the time. He wrote back, "Can we keep it?" Negatory, dear husband (this was one of my very best friends, after all), but I'll knit you one of your own. It won't be immediate, but I promise I'll have it done by our fifth wedding anniversary. I finished knitting our blanket before our sixth anniversary, but with our seventh coming up this fall, the eight pieces that need to be seamed still sit in their plastic bag, neatly rolled up. It's not the seaming that I'm putting off - I actually find that a relaxing task in front of a good TV show. It's the blocking that I am avoiding. I know I've blocked at least three of these strips, possibly up to five, but that leaves at least three, possibly up to five, that still need blocking. And I don't have enough blocking space to do them all at once. I'm posting this in hopes that seeing the pretty pictures on my blog will motivate me to get blocking - really it will only take a couple days even if I have to do five strips - and seaming before we move. I'm afraid that if I don't do it now, our ninth anniversary will be upon us before hubby gets his precious blanket. The pattern, btw, is the knitting world's famous Lizard Ridge, and the yarn is about 46 skeins' worth of Noro Kureyon. There is some more information about the actual knitting on my Ravelry page. I love the remnant bins at Joann's. I dig through them on each visit, looking for the bolt ends that are already on sale. Then, on top of the sale price, you get another 50 percent off because it's a remnant. If you are smart you can score fabric for a couple bucks a yard. Back when the girls were small, anything over half a yard was guaranteed to be enough to make something for them, so the remnant bin was awesome. 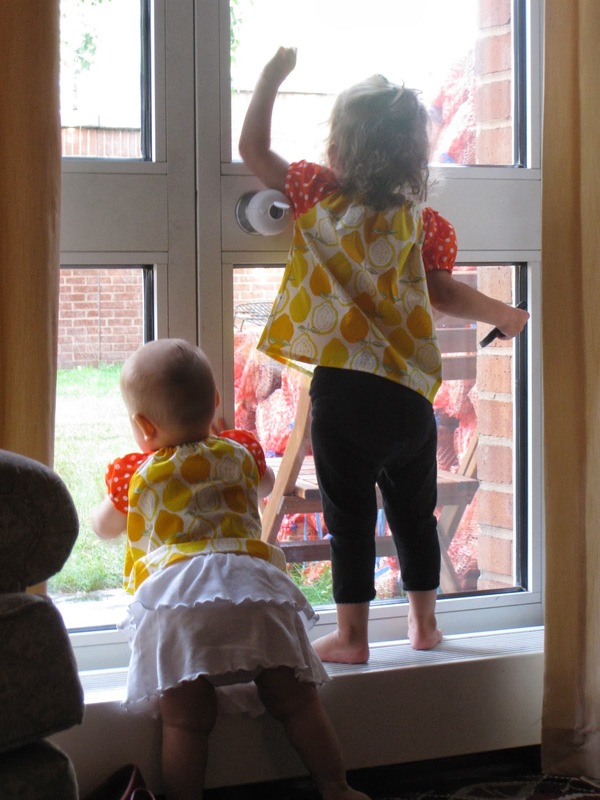 On our last trip to the U.S. (back when the boy was born), though, I tried to stick to boy-appropriate colors and prints, since my girls are getting so big. I think I paid about a dollar for this 21" piece of army green bottomweight cotton twill. It's 56" wide, so I thought I could definitely get a pair of baby pants out of it. 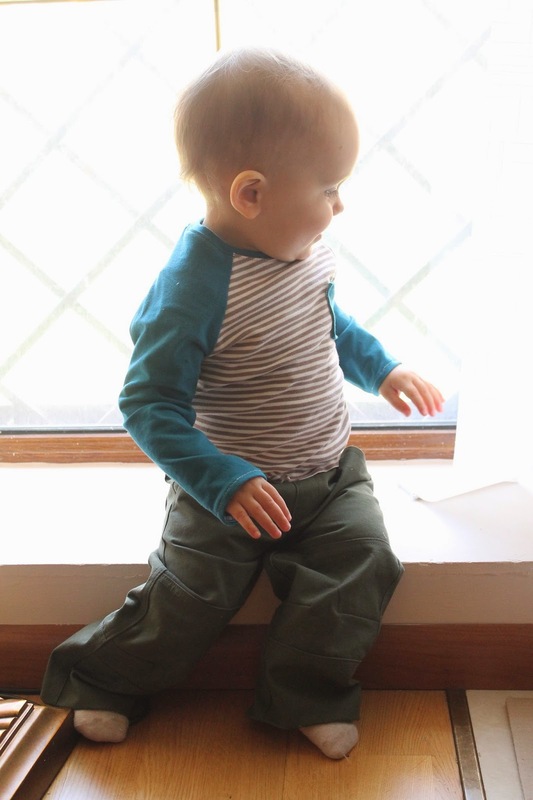 I chose the Oliver+S Field Trip Cargo pattern, which I hadn't made before. That's a satisfying sight, isn't it? Once the pants were done, I set to work on new tops. I ended up making three Field Trip raglans. The first (blue+stripes), I made in a 12-18 month width with 18-24 month length. The sleeves were plenty long, but the shirt was just long enough before hemming. So I lengthened my front and back pattern pieces by 1.5" (.75" for the hem and .75" to grow into) before sewing two more. 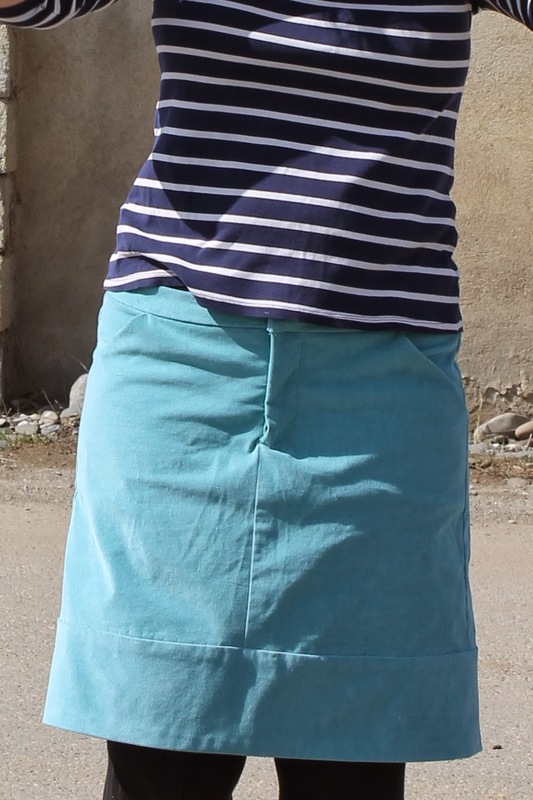 The striped knit, which I used on all three tops, is some Land of Oh interlock I bought while pregnant with the boy. It's very soft and substantial, but the unhemmed shirt is actually raveling a little! I thought knit wasn't supposed to ravel? Or is that just jersey? The body of the tan shirt is snuggly 80/20 cotton/poly velour. The applique is the letter G as it appears in the Georgian alphabet. Now that I look at it again, it kind of looks like an abstract Snork. Do you remember the Snorks? 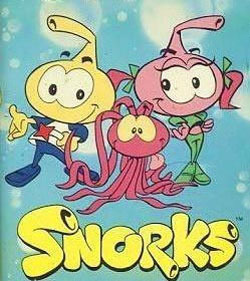 I loved the Snorks. It really is part of the Georgian alphabet, though. The yellow shirt is made of a yellow organic cotton jersey from fabric.com (meh), and some gray Free Spirit Essential Jersey cotton/spandex knit, (great stuff). I cut the pocket out of the interlock, but it's way too heavy for the flimsy jersey and pulls out a little when the kid is crawling. 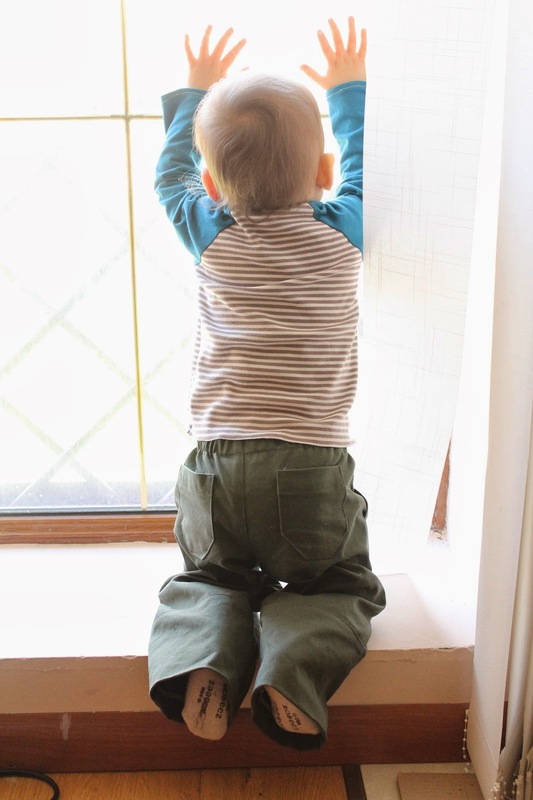 This is such a cute pattern for a little boy, and it is fast! The raglans took me about 40 minutes to sew together, and most of that was due to fussing with the pockets or applique. The cargoes only took about 2 hours of sewing (though I did leave off cargo pockets and belt loops). A good chunk of time was spent trying to coax my elastic through the waistband. It doesn't gather that well where the front pockets are because there are a lot of layers of twill and it is stiff. I could have graded the seams better, but short of that I'm not sure what is to be done there. For the legs, I just serged the edges and then blind-stitched a 1.25" hem for ease of taking down later. They are way long; I need to take up at least another inch. I'm hoping all the length means he'll still be wearing the pants this fall (and dare I hope, winter? Probably too much.) The diaper area is roomy enough to cover our bulky cloth diapers, though it JUST does so, and I sized up significantly from his waist measurement (17.5, smaller than the 6-12 month!). In sum: Great pattern as I have come to expect from O+S, and sure to get much use as the boy grows up and out! Back in January, I ordered a few patterns for me (New Look 6808, New Look 6781 and Simplicity 2447). Around that time the U.S. was pummeled by some enormous snowstorms, which completely screwed up the mail for those of us who have APO/FPO/DPO addresses overseas. My patterns f i n a l l y arrived last week after a torturous wait on this side of the world. I didn't waste time and immediately traced out View E of New Look 6808. I drafted a size 14+FBA for my 39-31-41 self, and I rotated the bust dart down into a French dart, which I find a little more flattering on me than your standard horizontal dart. Then I set about tossing through my stash for a suitable fabric. I've been paying a lot of attention to fabric choice lately, and I knew I wouldn't be happy with this top in a crisp cotton. I wanted something with a luscious drape, to skim over those wobbly bits and make me feel slinky. Slinkiness is elusive when your kids use you as a human tissue, trust me. But on those rare occasions when I can rock the slink, I enjoy it. Don't you like feeling slinky? After some digging, I found a piece of black something-or-other that I bought eight years ago in Armenia, when I used to have clothes made for myself by a local seamstress. I think I bought it intending to have a skirt made, but I never did and somehow it got packed and unpacked and carted around in our household effects for another four years until I began sewing. I don't even know what this fabric is - it's definitely synthetic, matte like chiffon but a bit heavier, and has a slight crosswise stretch. This pattern is meant to have vertical front darts. I sewed them in when I muslined the top (yes, I muslined, using an old sheet!) but it made the top too tight. I didn't think too hard about why it was tight, and just forged ahead. I thought that maybe the stretch in my fashion fabric would help out, and figured I could always sew the sides up with smaller seam allowances. Well, the stretch didn't help me. It might have, had I actually cut both the body pieces on the grain like I was supposed to - but somehow I accidentally cut the back on the crosswise grain, so the stretch on that piece runs bottom to top instead of side to side. Facepalm. I didn't have any fabric left to cut a new back, so I just went with it. I sewed smaller seam allowances (3/8" instead of 5/8") but in the end I just left the front vertical darts off. The back darts do provide some shape, so it's not a total potato sack. I later realized what the problem was. While my front FBA added width necessary to fit my waist and high hip, I had neglected to add the necessary width to the waist and hip of the back piece - I had just cut a straight 14, and I should have graded out to an 18 after the bust dart. So my side seam is not actually in the center of my side, and there was no fabric to spare for the front vertical darts. I actually kind of like it without the front darts, though. In my post-childbirth, gym-less life, my stomach tends to really show how much I ate that day; sometimes it feels like, if I eat a banana, you can see the banana shape through my shirt. So a top that skims over the lumps helps me feel put-together. Fabric choice was key in this, though. Most of my non-knit apparel stash consists of woven cottons, none of which would have been as fluid and skimming. When I finished the top, I felt like it was missing something. So I added the lace trim to the bottom. I am pretty happy with it top, though the collar turns out to be just slightly too wide for my taste. It's a bit sailor-girl, which is cute but interferes with the slinky. The collar on view D is a bit narrower. I think I will use that collar for my next iteration. I also plan to redraft my back pattern piece to be a little wider below the bust so that I can try out those front vertical darts. The wind on this particular day was killer. Chicago ain't got nothing on Tbilisi. There were a few times I was afraid the gusts would blow me off the cliff. I've been trying to sew down the old stash (since I've recently added, um, four packages of new stash and have two more on the way), and it's going fairly well. The only sticking point is that top shelf of my fabric bookcase - the one full of quilting cottons. You have a shelf like that too, don't you? They are just so tempting - the adorable owls, the trendy chevrons, the polka dots - oh, the polka dots, in every color combination imaginable. Yeah, I fell, and I fell hard. Ah, memories. This photo was taken about two and a half years ago, though somehow it feels like it's been much longer! But yikes, talk about Becky Home-Ecky! I don't remember what I was thinking pairing those prints, or using either one of them in these peasant tops at all - look at how stiff that fabric is. It makes the peasant tops look even more boxy than they are. A lighter, drapier cotton would have made a big difference. I made countless other outfits like this, and my girls wore them happily, before I realized that there was more out there. Fabric actually suited to apparel, that drapes nicely and doesn't stick out like a tent. Before you quilting-cotton fans out there storm my blog with pitchforks, let me just say that there are lots of beautiful prints on quilting cotton, and that they are lovely for many projects. Like quilts. And cloth napkins and table runners and nursery decor, etc. 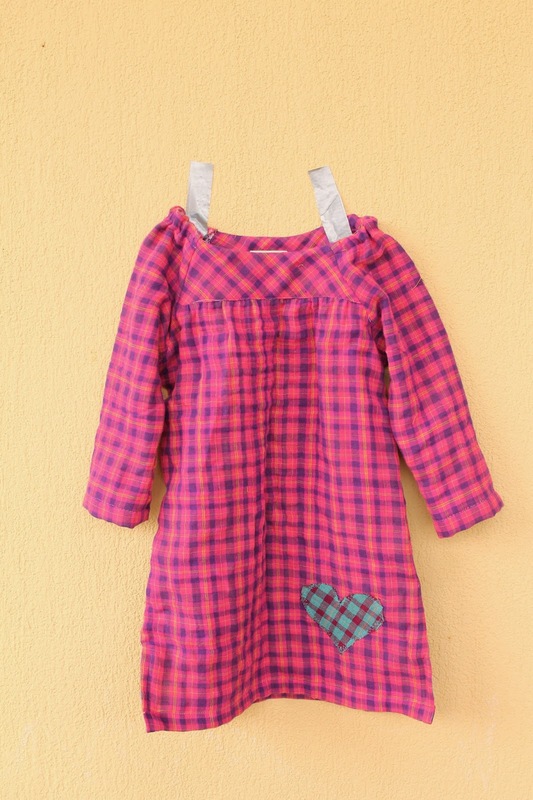 I think they can also make adorable summer skirts or fuller dresses for little girls. 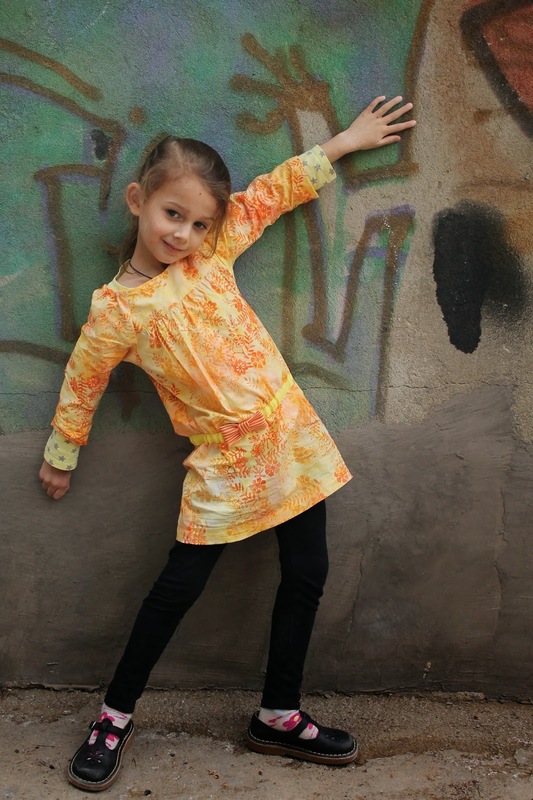 I mean, where would I find a print like this one except in the quilting cotton section (pattern: O+S Bubble Dress, fabric: Joann, project: last summer)? It's perfect for a three-year-old. And among the quilting cottons, there are some with a hand better suited to apparel sewing - some that are very shirting-like, like the orange batik I used for N's Class Picnic top (Legacy Studios from Joann). But when it comes to apparel, I think there is usually a better choice than quilting cotton. And since I order most of my fabric online and thus can't feel before buying, I have moved on to apparel fabrics: Glowing sateens and silky voiles, soft gauzes and crisp poplins. It's like a whole new sewing world. 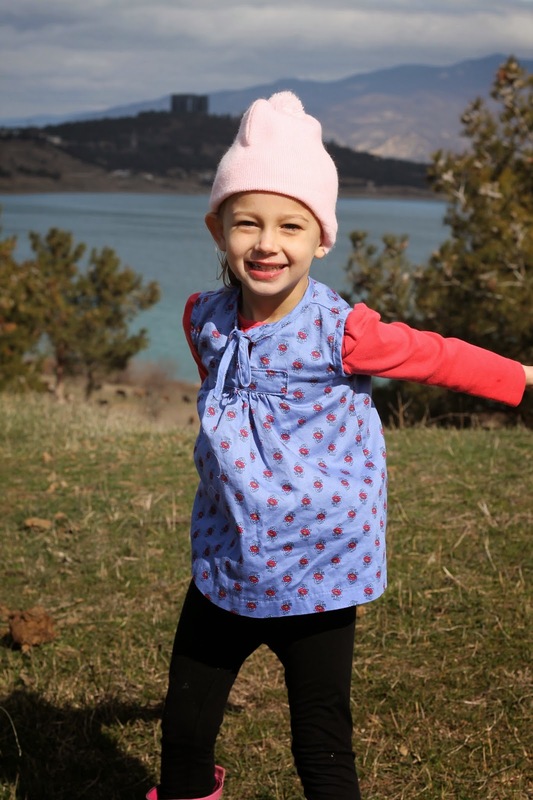 Recently, I let each girl choose fabric from the stash for an Oliver+S 2+2 Top (sleeveless, my favorite way to make them; actually, the only way I've ever made them). N chose a Lisette printed sateen and Z chose a yard of Michael Miller Meadowsweet (quilting cotton), which I fell in love with a couple years back. Do you see? 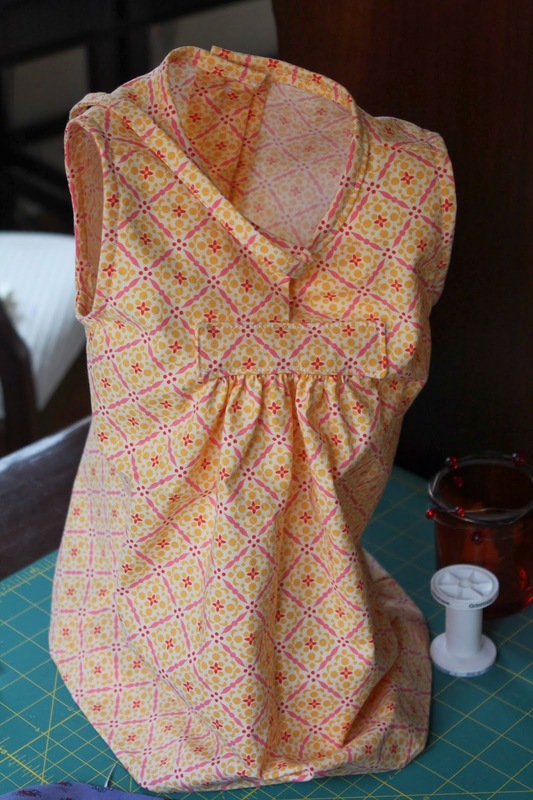 The top made from quilting cotton quite literally stands up by itself. There is nothing on the inside supporting that top, other than perhaps some sewing spirit that haunts those who choose the wrong fabric for the garment - it is just the stiffness of the fabric, which, yes, I prewashed and dried. The spirit wasn't interested in the sateen top, apparently. These pictures were taken on a windy day, but I think you can see how nicely the sateen falls compared to the quilting cotton. The material in this top reminds me of one of those paper cone cups they used to have by the water coolers in offices (do they still use those things?). I think the sateen is probably more comfortable to wear, too. Both girls are thrilled with their tops, though, and my stash is down one cut of quilting cotton, so I'm happy. 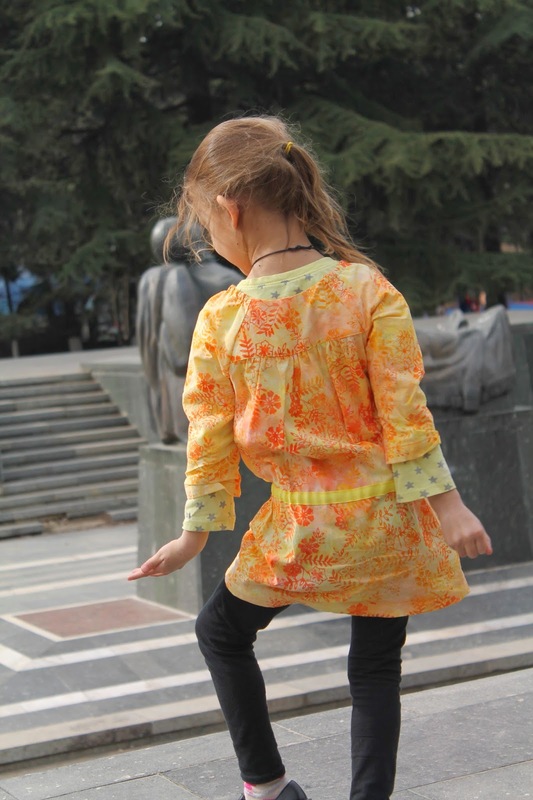 What about you - do you like the quilting cottons for clothing? If you have suggestions for ranges that use a less stiff substrate, I'd love some suggestions for those occasions when I just have to buy a trendy print. I have had the Grainline Moss Mini Skirt pinned forever. I don't have the legs for a mini skirt, but the longer version with the hem band is exactly the type of skirt I gravitate towards in stores, and which I always find flattering and comfy. I finally decided to sew one up last week. So, the fabric. It is a very stretchy stretch corduroy that I picked up when FabricMart was doing a corduroy clearance. FM called the color "seafoam." It's a color that I was kind of on the fence about. I figured it could go one of two ways: 1) springy and on-trend or 2) Rose from Golden Girls. What do you think? Rose is rocking a slouchy cardigan in exactly the shade of seafoam that I would prefer to avoid. I think that the color of the cord is a little deeper. 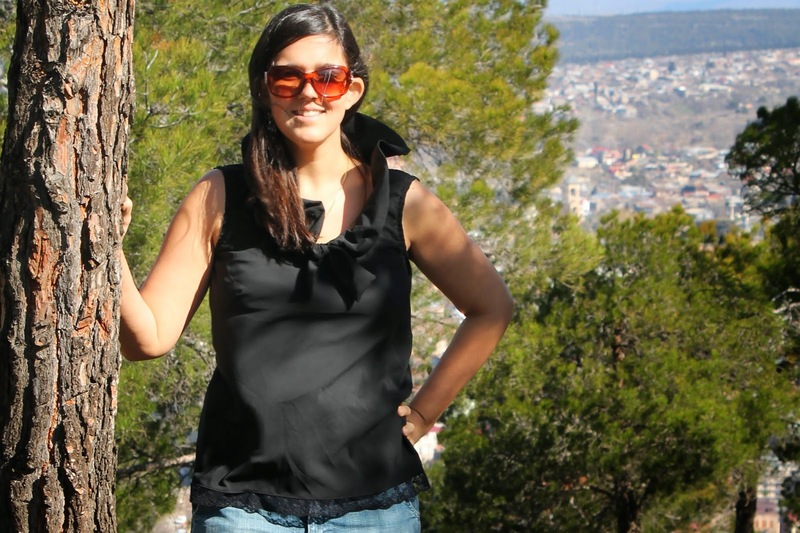 Though, now that I look closer at her shirt, it does bear a resemblance to the Traveler I am wearing in this photo. OK, that's a little creepy. I like the skirt. Although my waist and hip measurements correspond exactly to the size 12, this turned out a tiny bit too big. I'm guessing that's due to the stretchiness of the fabric, or perhaps there is more ease built into the pattern than I would like. (UPDATE: Well, it's more than a tiny bit big - within 30 minutes of wear it was falling right off my hips. I took an inch off each side seam, tapering to nothing 9" down the skirt and adjusted the waistband accordingly. I should mention that I was dreading the alteration but it actually took less than 40 minutes and now I have a very wearable skirt). Like several others in blogland, I ran into a problem with the waistband being a full 2.5" too short. I emailed Jen from Grainline and she responded to me basically immediately, which was awesome of her. She asked me to send her some photos of my skirt-in-progress and said she is aware that some people are having a problem, and plans to look into it very soon. Although I may have uttered a few choice words while working on that waistband, I have to say that I was impressed with this pattern support and will recommend Grainline to anyone because of it. The instructions are a little sparse in places, but I was able to construct the skirt with minimal frustration (other than the waistband). I lined the pockets with scraps of the pink plaid fabric from that Traveler shirt, so that outfit above is extra-matchy. The zipper and fly are not perfect, but being that this is only my fourth zipper ever, and the most successful by far, I am calling it a win. I will refrain from offering a close-up of my imperfections (and the royally botched bartack). It's good enough for government work. I look pretty dumb in this photo but, in my defense, it was REALLY bright out and the wind was insane. Most of the photos from the shoot were much dumber. I'm including it anyway as part of my new mission to provide around-town modeling shots. This one was taken in front of your typical Soviet and post-Soviet apartment blocks, pretty close to my house. In conclusion - the Moss gets a thumbs up from me. I'll size down for the next one and report back. 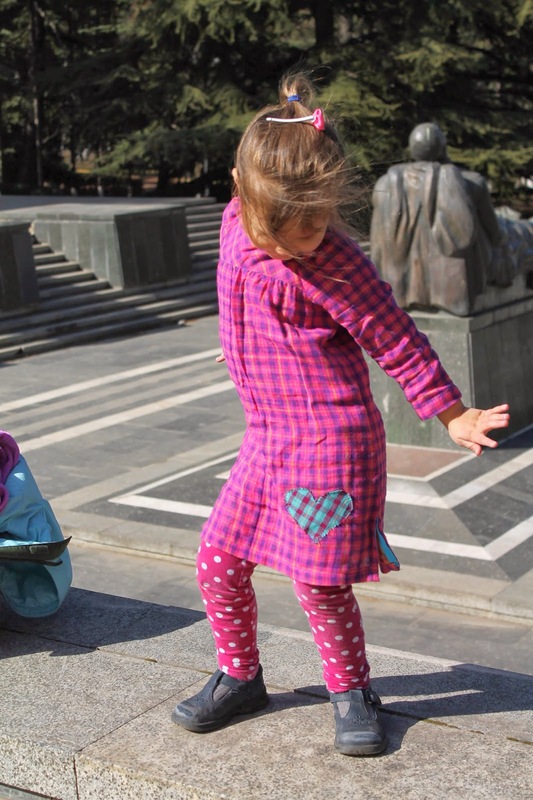 It is definitely spring in Tbilisi. The apple trees are blossoming, my garden is soaked with rain, and we've been able to get outside in just our fleece jackets ... or some days, no jackets at all! And when I think spring, I think Class Picnic Top. I have sewn five Class Picnic tops, almost all of those about this time of year in 2012, when I was willing spring to come to Russia. We got some good wear out of them all, but they no longer fit. So, last week each girl chose fabric from my stash and I got to work. 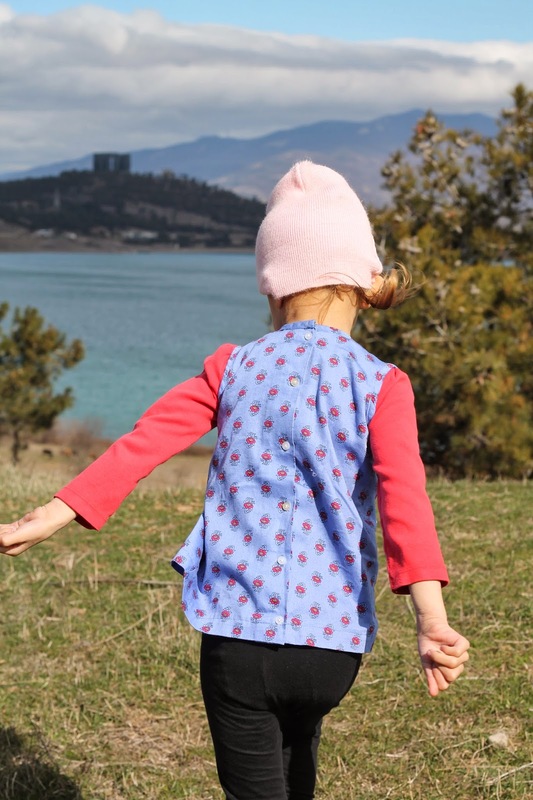 The outgrown tops were sewn in a 24 month size with 4T length. I knew I needed to lengthen the top this time, and for an arbitrary reason that I do not now recall, I decided to cut the 3T with four inches of extra length (though N is taller than Z, they basically wear the same size). As it turns out, that is long enough to make a Class Picnic dress for Z and a tunic for N.
Little Z's dress is made out of a yummy double-faced gauze from Fabric Mart. I had worked with the same gauze in a different colorway for my second Late Lunch Tunic so I knew the material was fragile. I used French seams to sew up the sides, and I added slits with ribbon trim. I used a scrap of the fabric left over from my own tunic to make a sweet heart applique. Z permitted me to snap the above photos (Mama's styling preference) on the condition that she could add her own touches to the outfit before school. OK, I said. Big sister N chose a lightweight batik quilting cotton from Joann's remnant bin for her top. I gave the tunic a drop waist by making an elastic casing out of some yellow grosgrain ribbon. I had just enough of this orange-and-white grosgrain ribbon to make a little bow. I thought it would match very well - though maybe it matches a little too well as you can barely see it from anywhere but right up close. The girls were so happy with their dresses that they couldn't help but bust a move. Geez Mom, can you stop taking photos already? I used a label off a roll of twill tape I got as a gift-with-purchase when I placed an order with the Land of Oh Etsy shop awhile back. This is the first time I've put in a label and I really like it. Maybe it's finally time to figure out what I want to put on my own labels and order some. 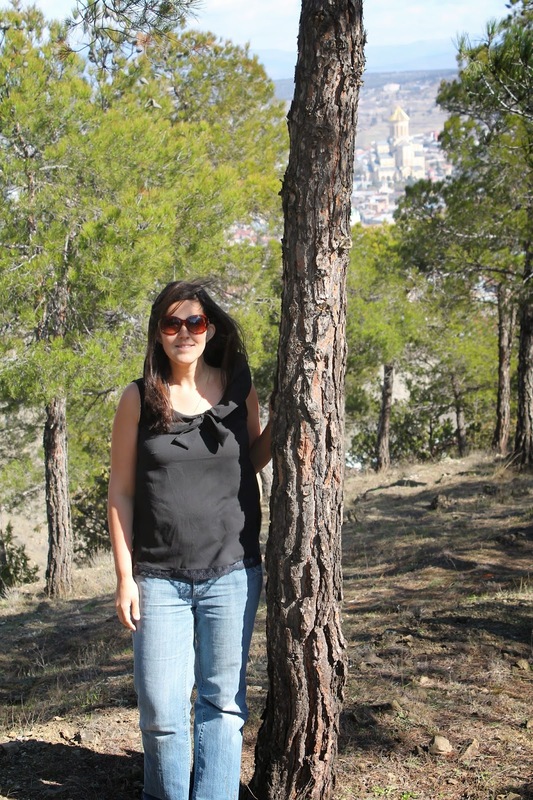 Last week, the lovely Paola from La Sartora nominated my blog for a Liebster award. Wasn't that nice of her? I did have to Google the award to figure out exactly what it was. Basically, it means she likes my blog and wanted to throw a few more page views my way, and for that, I thank her. The Liebster Award is a way for bloggers to recognize other bloggers with fewer than 200 followers. In exchange for the nomination, I have to link back to her blog, answer the five questions she set, nominate six small blogs, and pose my own questions to them. I also had to provide five random facts about myself. So here we go. 1. What is your greatest achievement? Childbirth. x3. 2. What motivates you? The drive to produce. My love affair with crafting began one day, 10 years ago, when I first picked up a pair of knitting needles. Ever since then, I have felt at loose ends when I'm not creating. I think this is why I'm more-or-less a monogamous crafter; with few exceptions I always need to finish the first project before starting on the second. 3. What is number one on your bucket list? Honestly? I hate the whole concept of a bucket list. It's too stressful. What if I don't tick the boxes? I don't want to be a failure! 4. You find $100 on the pavement. What do you spend it on? (It doesn't have to be sewing related!) C'mon, we all know it's going to be sewing-related. I'm boring - I would spend it all on fabric. Probably from Fabric Mart. I love Fabric Mart. 5. Summer or winter? Which do you prefer? I am all about embracing the season (as long as it doesn't go on too long, or present itself too severely). I love summer for a few months and winter for a few months. I will say, though, that if I had to choose between living on the Equator or in Antarctica, I'd choose the Equator. So I guess I prefer summer. Both my daughters were born at home, and the second one was born in the caul. Apparently that means she will be psychic or something like that. I used to have magic hair. Sometime after my oldest was born, my hair just stopped getting greasy. I could literally go two weeks between shampoos and no one was the wiser. This lasted about three years. In the last couple months I have had to return to more frequent washings and it.is.a.drag. I have lived in eight different countries (I guess that's not so random, given the name of this blog). I was a music major and I love to sing. I once gave a recital of arias at the Philharmonic in Yerevan, Armenia, and was a back-up vocalist on an album made by a friend of mine in Juneau, AK. My toes point upwards at roughly a 30 degree angle from the rest of my foot. I thought it was normal but apparently it's not. Dasha at Crafty Crazies. 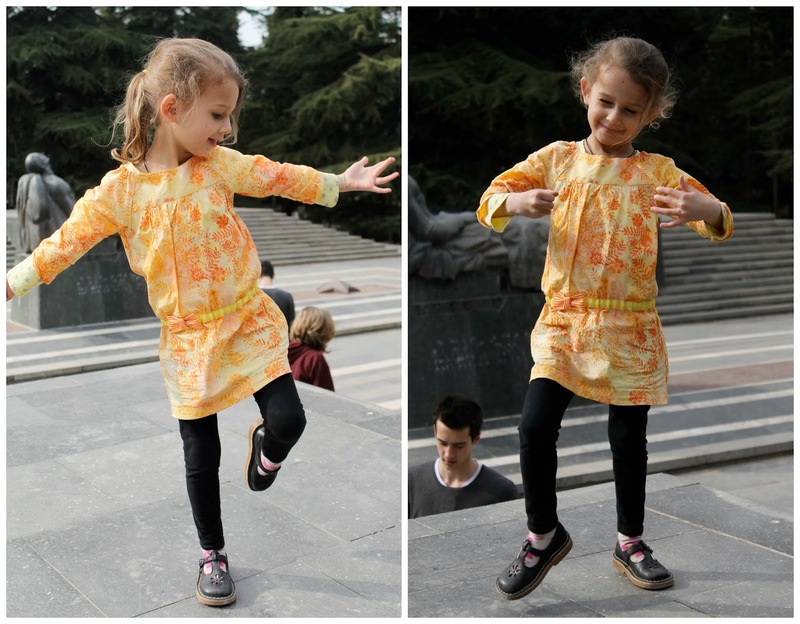 Dasha is my real-life friend, a fellow itinerant, a fantastic seamstress and mom to four (4!) beautiful girls. Inder at Inder Loves Folk Art. I discovered while checking out Inder's profile that she shares my love for Johnny Cash, Gillian Welch and Allison Krauss! Rock on Inder! Shelley at Bartacks and Single Track. 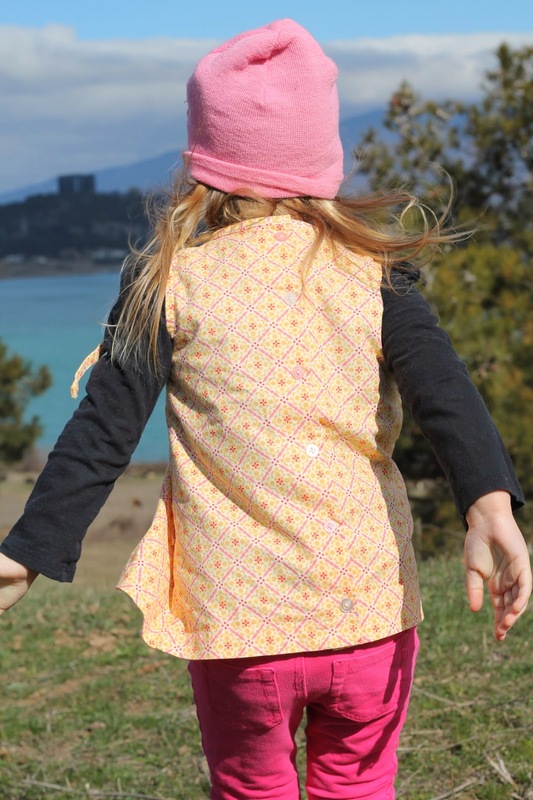 Shelley makes some seriously creative clothes for her kids and beautiful things for herself. Katie at the creative counselor. I love Katie's style - everything she sews is something I would wear. Janice at So-Cal Sewing Mom. Janice is a fellow Oliver+S devotee and has a daughter roughly the same age as my oldest, with similar style. I think they would be good friends. Ren at The Inspired Wren. Like mine, Ren's sewing blog is very new, but thanks to her graphic design background it is lovely to look at, and she posts tutorials every month! Justine at JustMeJay. Justine has seriously great taste in fabric and sews lovely things. Ock Du Spock at Ock Du Spock. Ock (for I do not know her actual name) blogs about sewing, but also about her amazing garden and the yummy things that she cooks. Meg at Cookin' & Craftin'. Meg lives the expat life in Bangkok. I recently found her blog, which showcases the awesome stuff she sews, using a lot of locally sourced fabric. In the smallest of small-world moments, it turns out that Meg's husband and my husband served in the Peace Corps together, and that I actually (briefly) met Meg five years ago. Cah-razy. 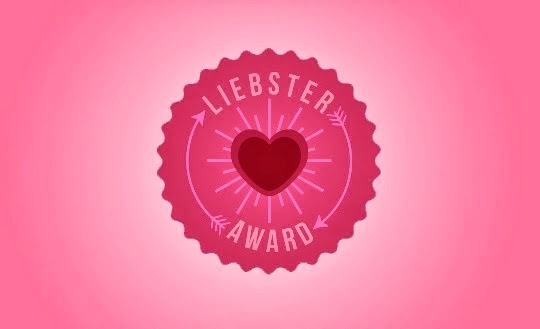 I'm so excited to pass on the Liebster love and can't wait to read my nominees' posts! Until next time. One simultaneously fun/not-so-fun aspect of moving is the issue of the sewing room. On the fun side - setting up a sewing room! It's fun to figure out where everything goes and make the space pretty. On the not-so-fun is all the time I lose to unpacking and packing. At the start of the tour, while I'm waiting an excruciatingly long time for our stuff to arrive - usually about two months - I scope out the space and look for the best place to set up my machine(s). 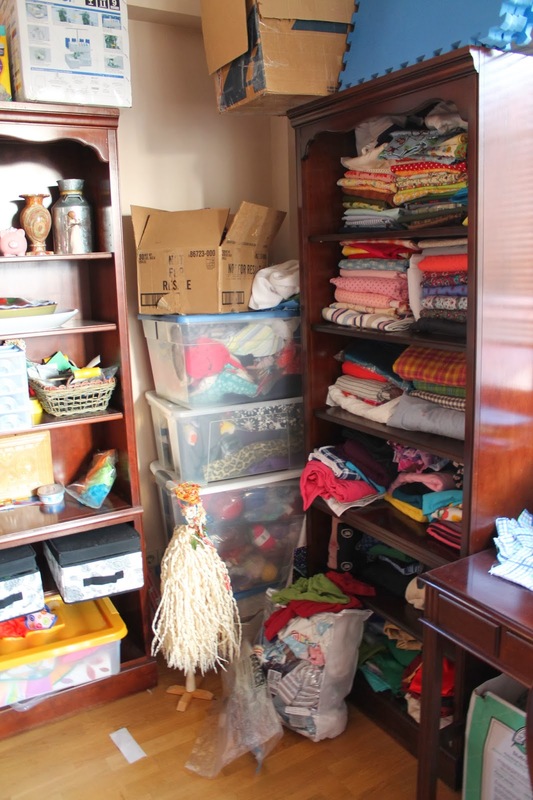 I generally don't get sewing until about a month after the moving trucks have come and gone - I have to set up the kids' rooms and the kitchen, at a minimum, before I can do my own thing. On the other end, I usually start pre-packing the house at least six weeks before the packers come. Sometime in there I try to get the sewing room disassembled; I prefer to pack my machines rather than leaving them to the movers. So that's 4-5 months lost to moving in each of the last two two-year assignments. 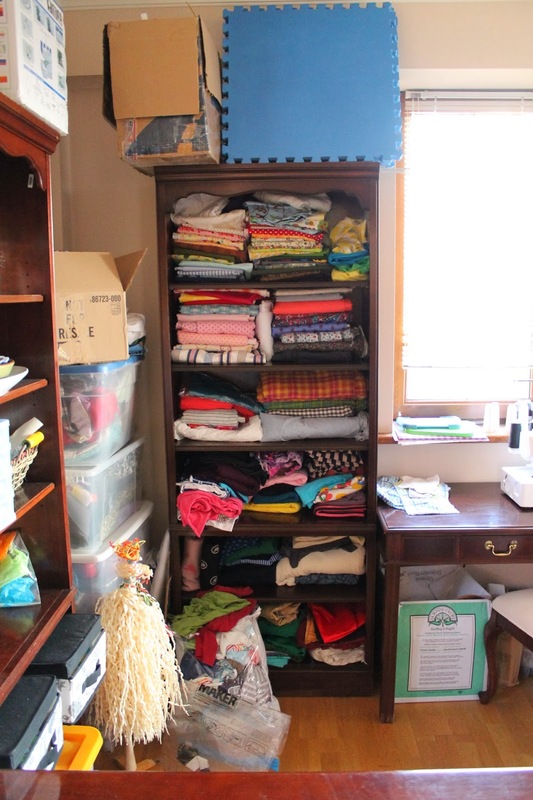 In between, here is what my sewing rooms have looked like. I had only been sewing for about nine months when we moved to Moscow. My machine (more pics below) was a very basic Kenmore that had belonged to my mother. She had barely used it, and when she gave it to me, the box had not been opened in at least 20 years. The machine only had two stitches - straight and zig zag - and the zig zag was stuck. I had it serviced and restored to full operating capacity. My sewing room in Moscow was a corner of the guest bedroom/office/overflow room. You can see my entire fabric stash on the shelves to the left. I kept patterns in the green dresser to the right, though back then I was still sewing mostly from tutorials. Now that I am a bit more advanced in my sewing it does seem counter-intuitive to sew only from free tutorials as a beginner. I have a future post brewing about the phenomenon, so that is all I will say about if for now. A year after we moved, I decided I wanted another machine. I really liked how heavy and stable my Kenmore was, and I liked that it was a metal, mechanical machine. So I bought another, fancier model, on eBay. This one happened to come with a walking foot, which changed my sewing world. This machine has served me very well, although it is currently refusing to do zigzag stitches on knits. It accepts "cams," which would enable it to do some decorative stitches. I keep meaning to find some and try them out, but I haven't yet. 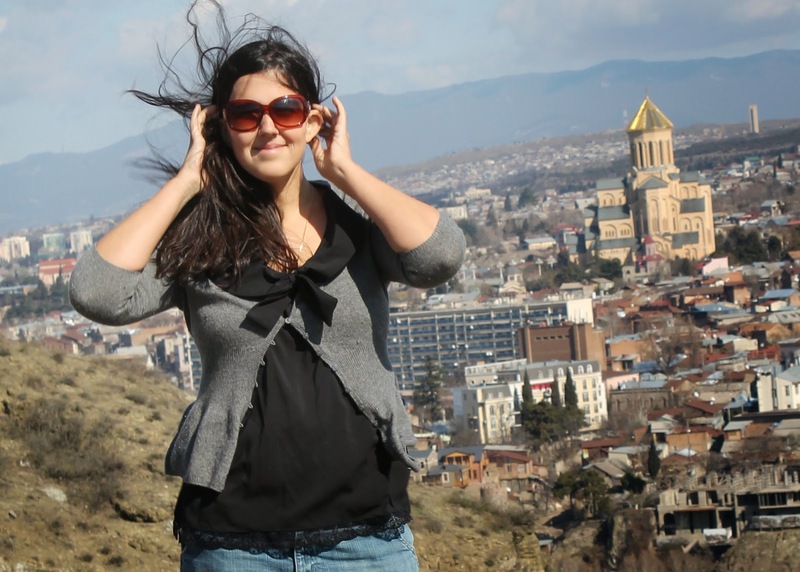 When we first set foot in our house in Tbilisi, which is literally twice the size of the tiny condo we lived in in Moscow, I couldn't decide where to set up my machine. There were too many choices. Ultimately we decided to section off 1/3 of the dining room as a craft space. The rest of the room is the kids' playroom. It is bright and airy with windows or sliding glass doors on all four walls, and gets the most natural light of any room in the house. Isn't it pretty? I was sewing on just the fancier Kenmore and the serger, but recently I set up the older Kenmore for twin needle sewing on knits and I really like having them all set up. I doubt I'll have this much room in our next house, though. I should mention that all the furniture is good old U.S. government-issue. It is what it is. I got my serger (the ever-popular, with good reason, Brother 1034D) shortly after we moved in. I love how easy it is to sew seams and finish them with this thing. The rolled hem feature, which I only recently mastered, has been really handy and is much quicker than doing a fiddly rolled hem on my regular machines. Most of my fabric is on these shelves, numbered from 6 at the top to 1 at the bottom. Shelf 6: On the top shelf I have what remains of my quilting cotton stash (every beginning seamstress's downfall, right?) and apparel cottons in quantities of .5 yd to 1.5 yds. To the right on that shelf are some PUL and swimsuit fabric cuts. Shelf 5: Apparel cottons and cotton blends in quantities of 2 yards. Shelf 4: On the left are rayons and cotton/silk, on the right are woven apparel fabrics in quantities of 3+ yards. Shelfs 4&5: Knits, of which I have suddenly accumulated a lot. Shelf 6: Dupioni silk, net/tulle overlays, other fancy-type fabrics and lining fabrics. The top two tubs on the left also hold fabrics - scraps in one, and fleece/minky/velour in the other. Another tub holds my yarn stash (which fits completely into it - yay!) and a fourth holds packing paper that I salvaged from the move and use for pattern tracing. That mess at the bottom of the shelf in a clear plastic bag is clothes for refashioning. I haven't really touched it in over a year so I should probably just donate all that stuff. There is one more tub of fabric, that contains my corduroys, velveteens and some flannel. To make my cutting table, I took two matching cabinets - I don't know what they are really called; buffets, consoles, something like that - and turned them back to back, then slapped my cutting mat on top. In the drawers of that console I keep my PDF sewing patterns. Underneath I keep some of my notions and then other craft supplies for the kids. On this bookshelf I keep sewing and knitting books, notions and printed patterns. On the bottom I keep interfacing and more clothes for refashioning. My paper patterns are in that brown basket. As I was writing this post it became very evident how much sewing-related stuff I have accumulated in the last four years. I feel like that should slow down now. I am at a place in my sewing development where I feel like I have both the skill and proper equipment to tackle most things. My one big challenge when we move back to the U.S., though, will be refraining from impulse fabric shopping. I'm certainly not immune to it now, but since I do 99 percent of my fabric shopping online, and I take for-ev-er to place an order (like at least a week of filling my cart and refilling my cart), I am able to keep it in check. I am ok with the size of my stash now but I don't really want it to get any larger! 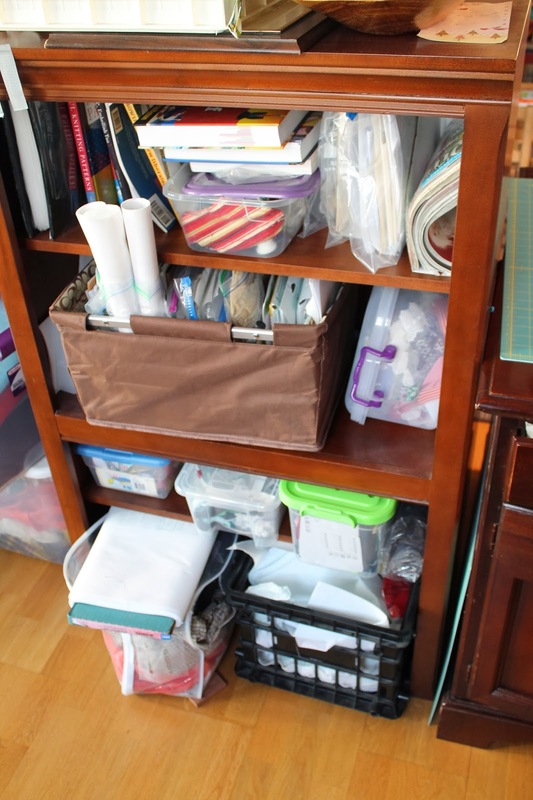 Hope you enjoyed this peek at my mobile sewing room. I hope to have another cute one to show you in a few months when we move again!